Although municipal waste only accounts for less than a tenth of the more than 2.5 billion tonnes of waste generated in the EU every year, it is very visible and complex in nature. During April's plenary session in Strasbourg, MEPs voted in favour of plans to update current waste management rules, including new targets for recycling, packaging and landfilling. The goal of these new rules is to promote the shift towards a more sustainable model known as the circular economy. Find out the details in our press release. 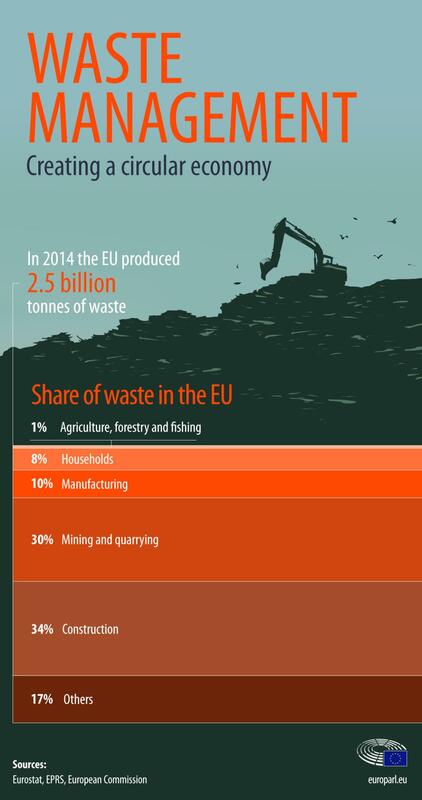 Infographic on the share of waste by sector in the EU. From 2005 to 2016 the average amount of municipal waste as measured per capita declined by 7% in the EU. However, trends can vary by country. For example, while municipal waste per capita increased in Denmark, Germany, Greece, Malta and the Czech Republic, it decreased in Bulgaria, Spain, Hungary, Romania and the Netherlands. In absolute terms municipal waste per person was the highest in Denmark, Malta, Cyprus and Germany, while the lowest in Romania, Poland, the Czech Republic and Slovakia. Wealthier states tend to produce more waste capita. Tourism also contributed to the higher rates in Cyprus and Malta. In order to look after the environment, waste either needs to be avoided or treated to reduce its impact. The EU wants to promote the prevention of waste and the re-use of products as much as possible. If this is not possible it prefers recycling (including composting), followed by using waste to generate energy. The most harmful option for the environment and people's health is simply disposing of waste, for example on landfill, although it is also one of the cheapest possibilities. According to statistics from 2016, 47% of all municipal waste in the EU is recycled or composted. However, waste management practices vary a lot between EU countries and quite a few countries are still landfilling large amounts of municipal waste. Landfilling is almost non-existent in countries such as Belgium, the Netherlands, Denmark, Sweden, Germany, Austria and Finland). Here incineration plays an important role alongside recycling. Germany and Austria are also Europe's top recycling countries. The practice of landfilling remains popular in the eastern and southern parts of Europe. Twelve countries landfill almost half or more of their municipal waste. In Malta, Greece, Cyprus and Romania this is more than 80%; in Croatia, Latvia, Slovakia and Bulgaria more than 60%; while it is also more than half in Spain, Hungary, the Czech Republic and Portugal. Other countries also use incineration and send almost a third or less of their waste to landfill: Estonia, Luxembourg, France, Ireland, Slovenia, Italy, the UK, Lithuania and Poland. Apart from Estonia, these countries also recycled more than 40% of household waste. Between 2004 and 2014, landfilling decreased substantially in Estonia (57 percentage points), Finland (41 percentage points), Slovenia (41 percentage points) and the UK (41 percentage points).